LLLUUUKKKEEE wrote: Yeah, it was more of a dream then a reality, I understand that it would be impossible to start as 2 sides. And if i can remember 10 years ago to high school, the gallipoli campaign was a disaster, so lucky i can start on both sides. It would appear that development of this map has stalled. If the mapmaker wants to continue with the map, then one of the CAs will be able to help put the thread back into the Foundry system, after an update has been made. 1. Left Legend removed and gameplay instructions incorporated into the right legend. 3. Battleships and landing craft space out more. No horses or generals remain. Cairns, are you bringing this project back to life, or is the update purely a response to your "should I continue it?" thread?? MrBenn wrote: Cairns, are you bringing this project back to life, or is the update purely a response to your "should I continue it?" thread?? MeBenn, let it sit a while longer please. I still think this could be a terrific map, but unfortunately, like trafalgar and poison rome, I wouldn't expect an outpouring of commentary. For my part, I've been meaning to write something lengthy here but haven't found the time. Maybe this evening, I've got quite a bit of foundryin' to catch up on. Incandenza wrote: I still think this could be a terrific map, but unfortunately, like trafalgar and poison rome, I wouldn't expect an outpouring of commentary. Take your time inca, exams are next week, and i won't be doing anything until next Thursday arvo my time. Do you want Jamaica and/or Gallipoli revived? So Gallipoli will be restarted will first. OK, here is version 9. I've removed the start numbers for now. 1. The beaches have been drawn in. 2. the impassables are starting to appear....are they OK. Does it need something else. Hey Cairns, great looking map here. The glaring issue I have is the villages. In the legend it says that the road allows each village to attack the next village down the line. The issue is that on the map the villages aren't clear. I know that you commented on page 3 of the thread that the single name terts are the villages but without coming and reading this thread I'm not sure there is a way that a player can tell what is and isn't a village. Perhaps something like a little hut on the village terts? Or if that makes it to crowded, a different color-something to make the villages stand out a bit there. barterer2002 wrote: Hey Cairns, great looking map here. The glaring issue I have is the villages. In the legend it says that the road allows each village to attack the next village down the line. The issue is that on the map the villages aren't clear. I know that you commented on page 3 of the thread that the single name terts are the villages but without coming and reading this thread I'm not sure there is a way that a player can tell what is and isn't a village. Perhaps something like a little hut on the village terts? Or if that makes it to crowded, a different color-something to make the villages stand out a bit there. Yeh hi barter2002. sorry but i hadn't added the villages, but if you refresh, they're there now. Villages look good there Cairns. There are 18 landing ships, 14 of which attack to the land and 4 of which attack to the sea mines. Each landing ship gets +2 autodeployed at the start of the turn but is subject to bombardment from shore forts. This brings up a question for me. Can any fort attack any landing ship? I was going to say that they had to be facing them but there aren't any facing the battleship side of the map-only in the straights. I've also been assuming that MS1-MS4 are landing craft and subject to the same rules and regs. There are 5 sea mines which I would guess should be able to bombard but there aren't any instructions for them at this time. It looks like there are 14 landing points which all will have a -1 auto reduce feature. There is also a note in the legend that all ships can bombard the landing points. Does this mean any ship i.e. can the HMS Jonquil, the L17 and the BS Golaith could all bombard C or are there only specific types of ships there. Then we have all the rest of the land terts which will each auto deploy +1. Does this include villages? I'm thinking yes since they're not singled out for anything else except their ability to attack along the road (i.e Deddulbahir to Krithia to Madios). As always I look forward to playing on this one. Wow, thanks for all these comments barterer2002. Yes the villages when they're on the map, make thing much clearer to understand don't they? 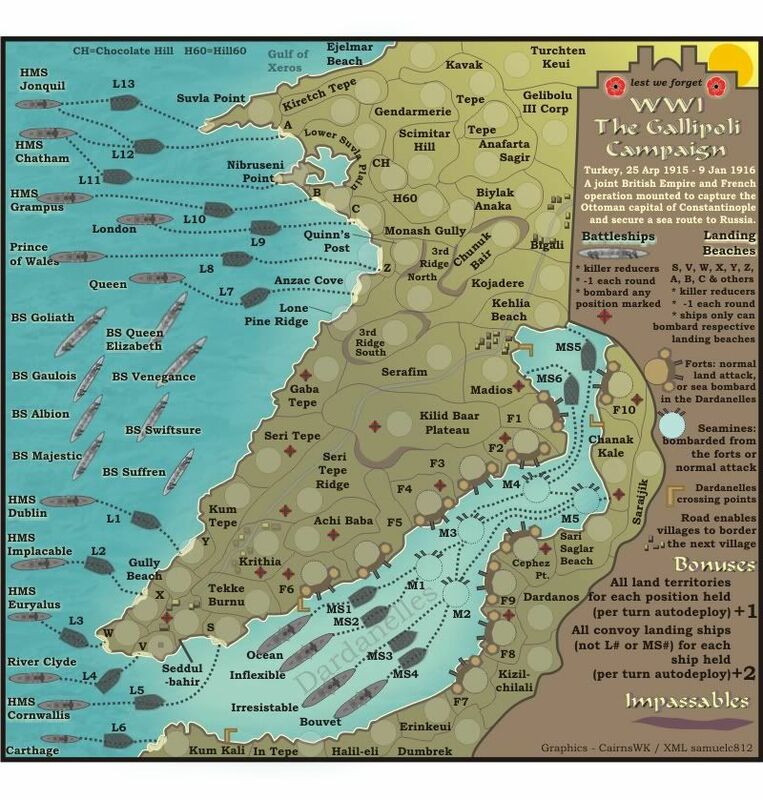 each one of the 18 landing ship gets the +2 autodeplay each turn, but only those in the Dardanelles can be bombarded from the forts. All L (landing) ships have been re-numbered. These are mine-sweepers (or is that too confusing) but yes, have the same r & r as landing craft. The sea-mines can be bombarded from forts or have normal attack abilities with borders, but i am uncertain at present if they'll start neutral or as starting positions. I'm kinda thinking the later, which will mean i'll either have to reduce the start positions on land or somewhere else. Any ideas would be helpful. "S, V, W, X, Y, Z, A, B, C & others" under landing beaches, which have killer reducers -1 for each round to use natural war attrition, and if held by the enemy can be bombared from their respective landing ship. See how you go with the new "destructions"
How does one conquer a battleship? There are a lot of gameplay features that, in my opinion, detract from the map rather than make it better. Things that don't really make any sense from a historical/battlefield perspective. Why do the battleships lose an army per turn... are they being bombarded? Why does a landing craft have to conquer and occupy sea mines before it can land? And for that matter, how can mines conquer and occupy something else? In one case the sea mine can conquer a land territory, which is even stranger. Can Fort F1 really attack the Ocean, even though it is in a different part of the straight and facing the wrong direction? Why is it that the landing beaches can occupy the landing crafts which can in turn conquer a capital ship? I continue to support the creation of a Gallipoli map. But this map doesn't reflect what went on there. After two months of bombardments men were dropped on the beaches, and they spent nine months pinned down and unable to advance until they were finally evacuated. This map is the opposite as the land seems like an open free-for-all with few impassables and villages that attack other villages up to four territories away. 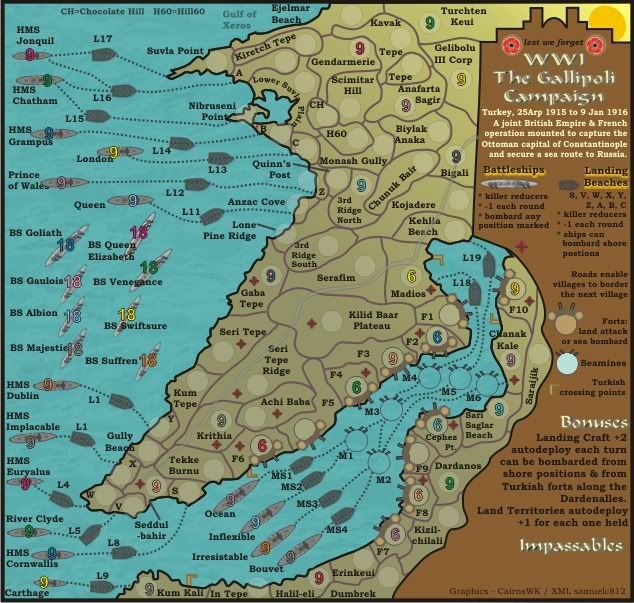 The names of the ships and locations are all there, but I would like to see the gameplay simplified and the focus put on what really went on in a very tragic historical campaign. oaktown wrote: How does one conquer a battleship? There are a lot of gameplay features that, in my opinion, detract from the map rather than make it better. Things that don't really make any sense from a historical/battlefield perspective. Why do the battleships lose an army per turn... are they being bombarded? You don't. that's why they are marked as killer reducers. After whatever number of turns they will become ineffective. Why does a landing craft have to conquer and occupy sea mines before it can land? Because as you probably know, those straights were mined and some vessels were sunk. And for that matter, how can mines conquer and occupy something else? How else do you display a sense of conquer and going forward. The seamines are way of blocking those forward movement positions if you can't overcome them. In one case the sea mine can conquer a land territory, which is even stranger. Yes. i will prob change that to a landing craft. Can Fort F1 really attack the Ocean, even though it is in a different part of the straight and facing the wrong direction? Yes, but i'll have to change the legend of course now you've pointed that out. Why is it that the landing beaches can occupy the landing crafts which can in turn conquer a capital ship? So should that be one-way? Of course you'd like to see it simplified as you've already mentioned elsewhere. So if's that's the case then some suggestions would be constructively helpful. I think the map reflects very much what went on there. The land would have been a free-for-all had the Entente troops been able to advance. 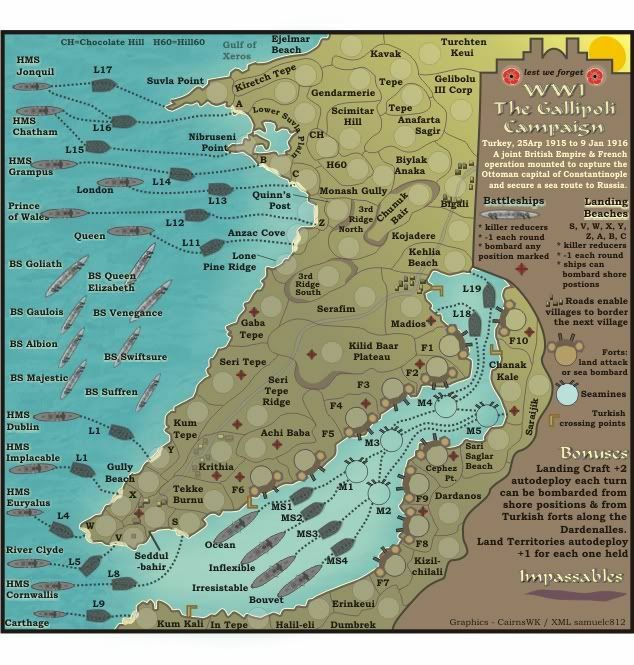 If you want me to make a map that is really Gallipoli, then the it would be very one-sided, wouldn't it? And in that case, why make the map if one side is always going to win? You very well know that in most of these situations with these historical maps, that they have a certain amount of artistic license. As for the impassables, they are all not on the map yet. Thanks for reviving this one I look forward to seeing it in action soon. I think the sea mines should be killer nuturals. That makes them more like mines, since forts wouldn't really attack mines. Can anything attack the battleships? If not, then how would anyone lose? If you just put your 3 on your battle ship every turn, the killer -1 bonus wouldn't ever get you, and no one could lose. captainwalrus wrote: I think the sea mines should be killer nuturals. That makes them more like mines, since forts wouldn't really attack mines. that is feasible. but wouldn't you want to be able to attack the sea mine positions if someone was advancing on them? Can anything attack the battleships? no, as previously stated nothing can attack the battleships. If not, then how would anyone lose? If you just put your 3 on your battle ship every turn, the killer -1 bonus wouldn't ever get you, and no one could lose. that does make sense that would be one way to win this map by continuing to place your three on a battleship. Do you think that battleships might have ability to assault bombard other battleships then? Also, should the -1 be increased to -2 or -3 to ensure that the battleships might get used early in the game rather than let someone sit on the them on all game? danfrank wrote: Thanks for reviving this one I look forward to seeing it in action soon. I agree with the second point, at the very least there needs to be a way to bombard the battleships. I don't know much about this battle historically, but wouldn't there be coastal artillery around to harass the battleships? Hey, thanks for commenting Echospree. and welcome to Galllpoli discussion. From what i understand, the battleships were too far out of range of the coastal artillery, and the battleships had more range than the coastal artillery. In RL, when the campaign failed, the battleships were used as part of the evacuation process after carrying out other duties. so what do you think about these 2 ideas? The map is really nice. I'm not a big fan the upper right part (yellow circle) but it's a spot in this awesome graphic. About Battelships: Increasing the killer (-2) value could be a good idea if you want that BS have take part only in the first turns of a game. About the seamines i think you can think them in a different way. Yes, you need something to advance troops from ships to land, so they can attack something or they'll be useless places. But in this way yo have to solve the problem "forts bombard seamines" and "seamine attack land". Why not to think this territories like a mined area and not single mines. If you 're in one of territories you lose X troops per turn due the dangerous zone. In the same way M5 will be a mined territory and not only a mine and it could attack land. Finally, not satisfied for your unlucky position, enemy can bombard the mined area to give you the final kiss of death. About bonuses: +1 for each position on land...beach are land territories? In that case the neutral will not have effect. In any case in a adjacent/chained game could be really annoying to have a so big amount of troops deployed in useless points. Convoy landing ships that have a +2 bonus are all the ships but not the L# , MS# and Battleships? Ineffetive, yes, but still in play. As in the dust bowl map these territories will drop to 1 and stay there. How does a game end? i thought killer reducers reduced to neutral?